The 37 metre motor yacht Lady Rima, listed for sale by Richard Tilley at Sunseeker London, has been sold with Sunseeker Cyprus acting for the buyer. Finished in black American walnut satin joinery with individual detailing, she boasts a timeless and striking interior built to the highest Sunseeker quality. There are lounge saloons on both the main and upper decks, numerous areas for socialising and a garage for water toys catering for energetic guests. 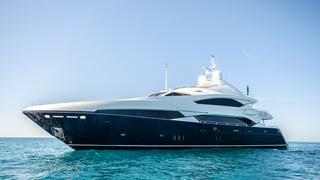 She boasts three internal decks, not including the sky deck above, and presents both the volume of a much larger boat and also the luxury that is promised by the brand name. The main saloon, with a richly decorated interior design, has a bar and spacious seating plus a large television screen and entertainment system acting as a divider from the dining area with formal seating for 12 guests. Equipped with twin MTU 12V 4000 M90 engines, she has numerous extras including stabilisers, a tropical air conditioning upgrade, an extended range fuel tank, a teak sky deck, stern thruster, FLIR camera and KVH V7 satellite television system, along with many other options.